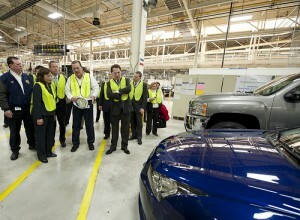 General Motors is one of the companies who have declared their interest in green chemistry. Photo: Flickr/Creative Commons. A movement to make chemical manufacturing more environmentally friendly has gained steam and turned Michigan into a national leader. The term “green chemistry” first appeared in the early 1990s, and has gained currency in policy, business and environmental circles, spurring an executive Green Chemistry Program, changes in university courses and influential business initiatives. It’s described as chemistry that is benign toward people and the environment, whether during a product’s manufacture, consumer use or after it’s discarded. It includes anything from corn-based plastic forks to soybean-based inks for printing on paper. “Our program is considered a model in the country,” said Tracey Easthope, the director of the Environmental Health Project at the Ecology Center, an Ann-Arbor-based nonprofit advocacy group. Created under Gov. Jennifer Granholm’s executive order in 2006, the program has brought together interests like the Ecology Center, government agencies and businesses small and large, including General Motors Co. and Dow Chemical Co.
“A lot of our big companies are talking about it now,” said Christopher Affeldt, an analyst at the Department of Environmental Quality. “There’s a lot of conversation about it in the furniture industry, with companies like Herman Miller Inc. and Steelcase Inc. assuring that their supply chains use green chemistry principles down the line. The auto industry has a huge, highly regulated supply chain in Michigan, Affeldt said, but in a perfect world, green chemistry comes before more regulations. “It’s about more than just waiting for the next restriction. It’s about incorporating safe materials all the way from the design. By using greener, more efficient substances, they can out-compete some of the trends in globalization that have taken away manufacturing jobs from Michigan, Affeldt said. Easthope said, “Michigan, unlike a lot of other states, still makes a lot of stuff here. We’re a manufacturing state. Concern about chemical effects on the environment was a primary reason why Grand Valley State University and Michigan Technological University have signed a pledge to educate their students in green chemistry principles, making Michigan a leader in education as well, Easthope said. The Green Chemistry Commitment, as the pledge is known, was started by the nonprofit Massachusetts-based Beyond Benign, according to Dalila Kovacs, a professor of chemistry at Grand Valley. Grand Valley now teaches two courses in green chemistry, including an advanced course in industrial applications, and gives out certificates, Kovacs said. Affeldt said, “A lot of times people hear chemistry and they immediately turn away. But the concept itself is one ultimately everyone can understand. The state Chemistry Program’s Roundtable is pushing for more universities to join the commitment. “Grand Valley, Michigan State, Kettering University in Flint and Wayne State have all received grants to develop courses around green chemistry,” Easthope said. The Midland and Ludington Dow companies have been multi-decade supporters of our Mason County Walleye Association (MCWA) and now as OxyChem Ludington. We supply the N-Central DNR fisheries with about 250,000+ walleye fingerlings a year covering a quadrant of counties from Ludington to Traverse City over to Houghton Lake, and upper Muskegon River system. The Ludington Oxy-Chem staff and retirees have been the core of the volunteer BOD helping MCWA raise our walleye. Thanks. Eek! Factory farming, with all its inherent fossil fuel use, and using GMO crops and their inherent political and environmental issues, are what are used to produce all those “benign” soy-based inks and plant-based plastics.